We have seen Photoshop work in a browser, and it looked pretty good. 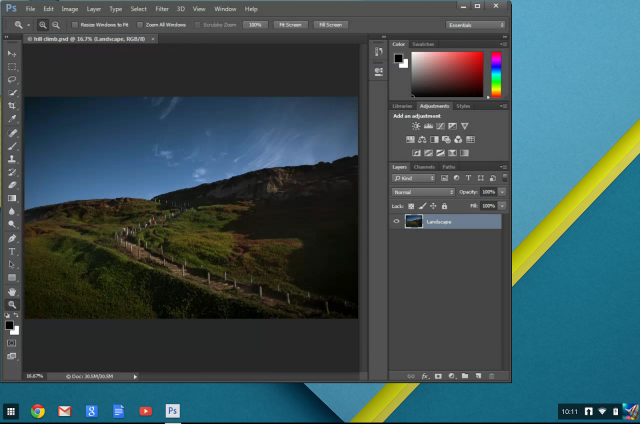 “Streaming Photoshop” is Adobe and Google’s plan to bring the incomparable photo editor to Chrome OS and the Chrome Browser. We covered the original announcement, but we were recently given the chance to talk to Adobe about the project and see it actually working in a Chrome browser. “Streaming Photoshop” is a Chrome App that you download from the Chrome store (provided you are whitelisted). The app opens in a window that looks just like a local version of Photoshop—there’s no browser UI of any kind. Photoshop lives on a computer in the cloud, and a video feed of it is streamed to the Chrome app. The app captures clicks and sends them to the server. It sounds like using it would be a clunky mess, but the whole process looked indistinguishable from a local install of Photoshop.